Today let us talk about the impressive town of Bhaderwah which is cradled in the foothills of the Himalayas in the Doda district of Jammu and Kashmir. You can pleasantly call the town as 'Mini Kashmir' which is just 80 km away from this place called Batote while about 205 km away from the city of Jammu. The town is simply gorgeous with quite a few praiseworthy grasslands, unexplored valleys, glittering water-bodies, rocky terrains and a rich variety of flora and fauna. What else is Bhaderwah addressed as? Can you guess? 'Nagon ki Bhoomi' or the 'land of snakes'. It is the choicest homeland for many different species of snakes and at an elevation of 1613 m, it is a captivating sight in Jammu. Be it a vibrant vacation or you are simply in the mood of some adventure, Bhaderwah welcomes its visitors with open arms to witness all its beauty. By Air: The airport within closest proximity to Bhaderwah is the Jammu Airport. There are direct flights from Delhi, Bhaderwah, Srinagar and Leh which operate via airlines like Air India, SpiceJet, GoAir as well as Jet Lite. You can then avail a bus or perhaps a private taxi from Jammu Airport to Bhaderwah. By Rail: Have you heard of Jammu Tawi? It is the most important railhead for Bhaderwah located in the Jammu city, 206 km away. It is connected to all the major cities of India while Udhampur is yet another railhead for Bhaderwah which is 120 km away. It has trains connecting Delhi, Ahmadabad as well as Allahabad. By Road: Despite sharp inclines and hairpin bends, Bhaderwah is connected to Jammu by an all-weather road. You can spot the road being divided into 4 generous parts like Jammu to Udhampur (64 km on NH 1A), Udhampur to Batote (55 km on NH 1A), Batote to Pul Doda (48.5 km on NH 1B) as well as Pul Doda to Bhaderwah (29 km). If you take regular or deluxe buses, it takes some 7 hours from Jammu to Bhaderwah whereas it takes 5 to 6 hours via Udhampur. You shall also come across tourist places like Batote and Patnitop on the way. You shall enjoy being in Bhaderwah all throughout the year because the climate here is almost always cool and comfortable. However, you shall have a gala time during the months from March to November and be ready for lots of glistening white snow kissing your feet between the months of November to April. 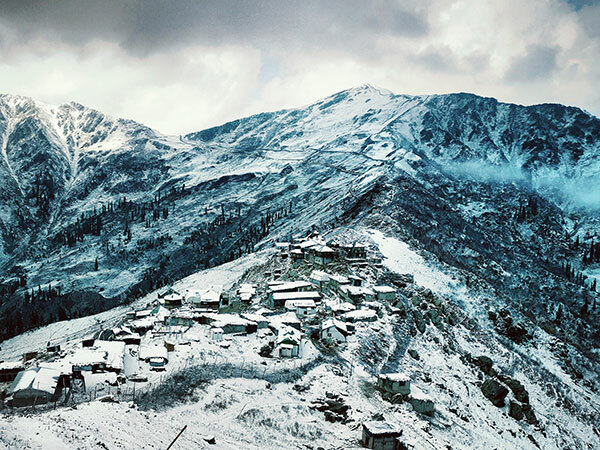 Now, lets head to the tourist places of attraction which make Bhaderwah of Kashmir all the more exciting! Have you ever thought what the gushing of the Chenab river gives rise to? At an elevation of 6500 ft above the sea level, it leads to the formation of the Chinta Valley which is encircled by dense coniferous forests on all sides. The Chinta Nallah pierces right across it while the region flaunts many picturesque spots like Thuba which is the sharpest point that separates Chinta Nallah from Bhaderwah. Would some horse riding facilities enlighten you from Baggan to Thuba or an age-old temple dedicated to Lord Shiva shall attract your attention? If you travel 6 km from before the Chinta Valley, right on the Chinta-Bhaderwah road you shall find a trail leading to the Subarnag Peak. Guess what lies at a height of 10200 ft? The Subarnag Temple! Relax here and let your soul breathe in the entire town of Bhaderwah and also take in the entire mesmerizing sight of the valleys spread around. The exquisite landscapes make the place all the more magical. Do you know which two places are referred to as the jewels of 'Paradise' on earth? Gulmarg and Pahalgam. So, then we can refer to Bhaderwah as the crown which is the pride of the Jammu region and the Seoj Meadow is the shining diamond in it. It is amazingly beautiful and the pious Kailash Kund in the southern region, with its snow-covered mountains, the place is like a dream come true! You cannot miss the exotic landscape at Shankh Paddar as well. Now let us talk about the meadow at Seoj! The Seoj meadow is adorned by a captivating river on its western side that emerges from the hills bordering the Kailash Kund. If you move your eyeballs towards the landscape across the river, the sensuous Pahalgam shall leave you spellbound whereas the eastern side is blessed with grasslands. When it comes to the meadows, the western side highlights the sparkling water of Seoj rivulet and gushes towards Ramnagar areas of Udhampur district. Let me tell you another interesting fact that Seoj Dhar is also the unrequited camping ground for numerous yatris of the popular Kailash Yatra who descends from Bhaderwah. Imagine receiving heavy snowfall going to a depth of 5 m and staying with you up to mid-June? Padri, which is just 40 km from Bhaderwah, is situated at an elevation of 10500 ft. It lies on the Chamba road and gives ideal picnic goals which you shall cherish for a lifetime. This meadow expresses a lovely palette of green where it ranges from a light green shade to all comforting green colour types! This place shall give you an adrenaline rush with activities like skiing during the winters and smooth paragliding during the sunny summers. As soon as the month of July approaches, millions of Mani-Mahesh Yatra pilgrims cross-by to hop-on to their destination. Your soul shall be refreshed with the array of sports like trekking as well as horse-riding. How about putting on your trekking shoes and unravelling the southern extreme path of the Bhaderwah valley? How does Sartingal stand out from the rest? The glistening sunlight topped with the breath-taking breeze from Kailash as well as the Ashapati Hills and neighbouring forests makes the abode heavenly. The valley comprises melodious streams in the background of mountains painted with lush green forests. You shall feel strongly bonded with nature while the visitors blissfully undertake the beauty of the surroundings. That's Sartingal for you! The enchanting Jai Valley is located some 32 km away from Bhaderwah. The way Jai Nallah bifurcates the valley before mixing with Kalgoni Nallah and produces rapid waterfalls results in quite a challenging atmosphere for the rock-climbing fanatics and the enthusiasm it shall give rise to in you, shall undoubtedly leave you transfixed. Heard about the captivating hunting grounds of Bachdar? It is present on the Jai-Bhalessa Road which is joint with the Jai Valley at around 46 km away. There is this Bhalessa Valley which lies to the east. Admire a fascinating group of plant and animal species here as well as the famous herbs of the wilderness that have made a mark here like the Digitalis Purea, Aconitum and Podophyllum.